A Linksys WRT54G router contains a basic firewall to help protect your home network. A Firewall blocks incoming connections by nature. Sometimes you need to unblock some of these connections so you can run a game or application. This is called opening a port or port forwarding. Port forwarding is literally forwarding a port from the Internet to your home network. Setup a static IP address on the device or computer you are forwarding these ports to. Login to your Linksys WRT54G router. Make your way to the port forwarding section of the Linksys WRT54G router. Uncheck Block Anonymous Internet Requests. Click on Port Range Forward. Lastly, you want to create a port forward entry. If this sounds difficult you are not alone. We will walk you through each step in opening a port for the Linksys WRT54G router. It is time to login to the Linksys WRT54G router. To do this you need to use a web browser because the Linksys WRT54G router uses what is called a web interface. It normally doesn't matter what web browser you use so go ahead and open up your favorite. If you don't have a favorite or are confused, open up Chrome, Firefox, or Internet Explorer. Once you have opened up a web browser, find the address bar. This is usually at the top of the page like the image below shows. In the screenshot above you should see an address bar with the address of 192.168.1.1 in it. Go ahead and erase the address you see currently in your address bar and replace it with the router's IP address. Note: A Router's Default IP Address is also commonly called the Computer's Default Gateway. In this box you should see a space for a username and password. Go ahead and enter the username and password for the Linksys WRT54G router in the spaces available. Remember if you have changed them in the past, you need to enter those values. 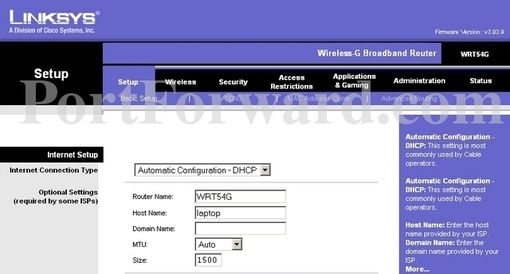 Enter your username and password, and then click the Login button to log in to your Linksys WRT54G router. If the username and password did not work I recommend checking out our Default Linksys Router Passwords page. If, after trying the above list of passwords you still can't login you may need to consider a reset for your router. Learn how to do that by reading our How to Reset a Router guide. After resetting the Linksys WRT54G router your username and password are reverted back to factory defaults. After a successful login to the Linksys WRT54G router you need to find the port forwarding section. We begin on the home page of your router. First, you click the Security option at the top of the page. You should now be on a page that says Firewall in the left sidebar of the page. Uncheck the box labeled Block Anonymous Internet Requests. Now click the option at the top of the page labeled Applications & Gaming. A new menu just below the black bar should appear. Select the option of Port Range Forward. Put a name for this forward in the Application box so that you can remember why you set this forward up. The name does not matter so pick something that has meaning to you. If you are forwarding a single port, enter that port number into the Start and the End boxes. If you are forwarding a range of ports, enter the lowest number of that range into the Start box. Then enter the highest number of that range into the End box. 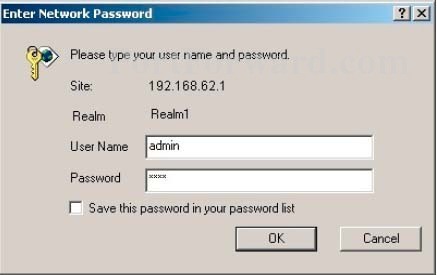 You need to enter the IP address that you are forwarding ports to in the IP Address box. It's possible for this to be either the IP address of your computer or any other IP address on your network that you want ports forwarded to. When you are completely finished, click the Save Settings button at the bottom of the page to apply these changes. Learn more about how to Setup your router. A full listing of all our games and applications that require port forwarding. We also have the Internets largest selection of Router Screenshots.